Why do you buy the products you buy? What influences your buying decisions. In class, we will cover the first section of this chapter on consumer behavior together. Working in groups of two or three (10 groups total), we will break up and distribute the other sections of the chapter. Each group will learn and teach their section to the class. Visual Aid - Presentation, Thinglink, Posters, Infographic, Mural, Google Site, etc. Make sure to include examples, ideally from the sports/entertainment industry. Add your learning materials to this collaborative page (Share --> Get shareable link --> More --> Anyone with the link, add group member's names and your section). Your lesson should be about five minutes or less. Was your group ready to present on time? Did you make sure to include all the important points from your section? Did you include examples (ideally sports/entertainment)? Was your lesson/presentation engaging and/or creative? We will test your teaching abilities with Kahoot. Break into groups of four or less. Each group will get one of the buying situations (1-5) from above (printed/handout). Create a skit (acting) that demonstrates your situation. As a class, we will try to identify the type. Alternate Fall 2018 - Choose one other person to team up with. Use one of the video/presentation tools listed on this site to create a video that demonstrates your situation (we will determine which number/situation you have in class) [about three groups per number/situation]. We will randomly choose a few groups to showcase. Add your creation to this collaborative page. 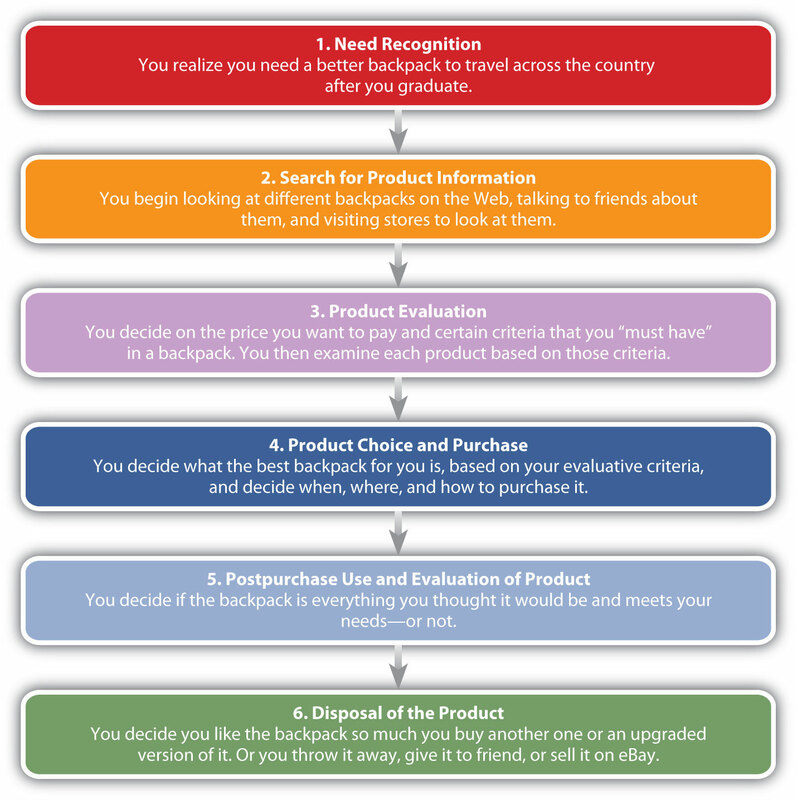 We will use this image from the online book to learn about the stages of the consumer buying process. You were out on the water the other weekend and now your phone is at the bottom of the lake. We will use this collaborative page to go through an example together. We'll check out this video (stop at 6:10) on planned obsolescence and here is one example from recent news. Use this rubric to complete a high involvement decision using the buying process.